The real travesty here is that Blizzard’s answer to a technical problem on their end is to punish players and in doing so (the real crime is) push people away from participating in massively multiplayer pvp combat… Wait ummm isn’t WoW you know an mmorpg… doesn’t the mmo in that stand for massively multiplayer? They need to think long and hard about better solutions for this than getting people to not do it. The one thing I’ll say though is that this will absolutely work. Within a couple of weeks people will be so spread out over the week, frustrated or just done with WG that in no time the zone will look just like Western Plaguelands pvp towers, empty, unused and eventually forgotten. Saying that whis will kill the zone is just retarded, how many times have you gone into WG in a raid group and picked up a few of the daily quests in the evening and shared them. Usually 80% of the people that I share these with “Has already completed that quest”. This tells me that at least 80% of the people there are there for that battle. Bliz is desparate to fix the lag in there right now and they are trying to tweak a few things to try to bring the player base down a bit. IMO I think it will still be over populated but I’m holding out hope that it will improve some day. Honestly if I really need some quick gold WG isn’t usually my place to grind the dailies. Hodir is much faster and easier then WG. That being said WG dailies are much more entertaining. I would say that this change actually makes wintergrasp more profitable in a effective currency / hour level. 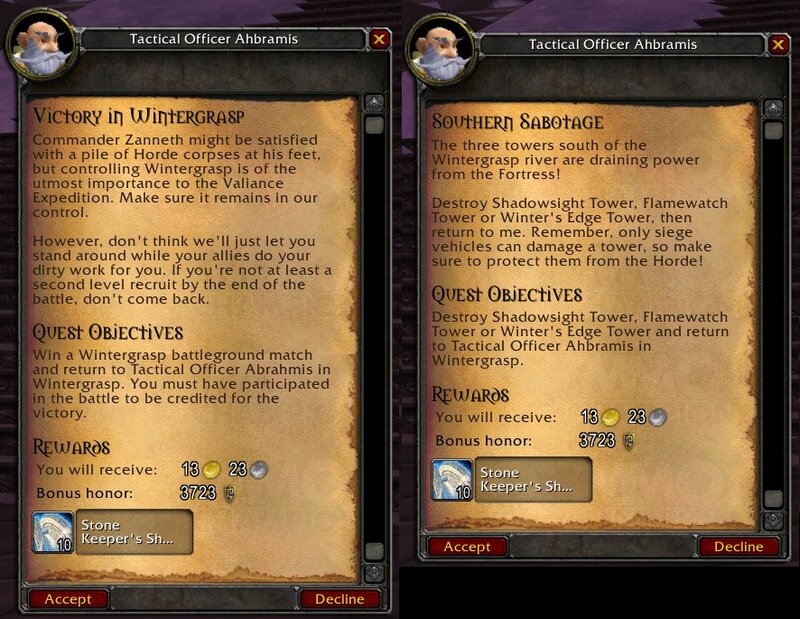 Since I can do all the possible quests in 15 minutes that are now 3-4 times more effective than before, and then not enter a wintergrasp for the whole week except for the Vault. And this way, it does as blizzard wants, and disincentivise the number of players in wintergrasp. As to whether that is a good thing, only time will tell!